Extensor mechanism (EM) insufficiency after total knee arthroplasty (TKA) is a rare but debilitating complication, occurring in 0.1% to 2% of cases.1 Historically, poor outcomes have been shown with primary EM repair.2–5 Results of allograft reconstruction using Achilles tendon bone block6,7 or whole EM allograft8–12 have been variable, with high rates of prosthetic joint infection and progressive tissue elongation resulting in late extensor lag. Browne and Hanssen13 recently introduced a novel technique using polypropylene mesh (Marlex mesh; C.R. Bard, Murray Hill, New Jersey) to reconstruct patellar tendon disruptions following TKA. Several small reports have evaluated this method as an augmentation to repair quadriceps rupture after TKA.14,15 This technique carries no risk of disease transmission and is more cost-effective than allograft.12 There are no long-term data available regarding complications and durability of these synthetic constructs. The current authors report their experience using synthetic mesh for reconstruction of a variety of EM deficits. They hypothesized that synthetic mesh allograft would provide durable functional and clinical outcomes when used for EM reconstruction following knee arthroplasty. The primary outcomes of this study were graft incorporation, residual extensor lag, and final ambulatory ability. Secondary outcomes were Knee Society (KS) scores and visual analog scale pain scores. After institutional review board approval was obtained, a retrospective review of the orthopedic database of the authors' institution was performed to identify all patients who experienced EM failure after TKA or unicompartmental knee arthroplasty and subsequently underwent EM reconstruction using synthetic mesh from July 2011 to February 2018. A minimum of 6-month follow-up was required for inclusion in this study. Extensor mechanism reconstruction was performed by 2 fellowship-trained arthroplasty surgeons (S.K., A.J.T.) according to the technique of Browne and Hanssen13 (Figure 1). The postoperative rehabilitation protocol included 8 weeks of long leg cast immobilization in full extension with isometric quadriceps exercises. Progressive knee flexion was then initiated in a hinged brace, allowing 0° to 30° for 4 weeks and achieving 90° during a 4-month period. Extensor mechanism reconstruction using tubularized Marlex (C. R. Bard, Murray Hill, New Jersey) synthetic mesh. The mesh was prepared using interrupted nonabsorbable sutures (A). A trough was created in the anteromedial proximal tibia. The mesh graft was secured in the trough with cement and a transfixion screw and washer (B). The mesh was passed through a lateral soft tissue portal, allowing interposition between the mesh and components. The mesh was then secured proximally and the vastus medialis was mobilized to overlay the mesh in a pants-over-vest repair (C). Patient demographics, pre- and postoperative range of motion, postoperative residual extensor lag, pre- and postoperative visual analog scale pain and KS scores,16 and any complications were extracted during chart review. The authors defined failure as residual extensor lag greater than 30°, need for revision EM surgery, or prosthetic joint infection. Continuous variables were compared using the Student's paired t test. The α level for statistical significance for all tests was set at .05. Analyses were completed using Prism 7.0 (GraphPad, La Jolla, California). Fourteen patients who underwent EM reconstruction using the synthetic mesh technique were identified. 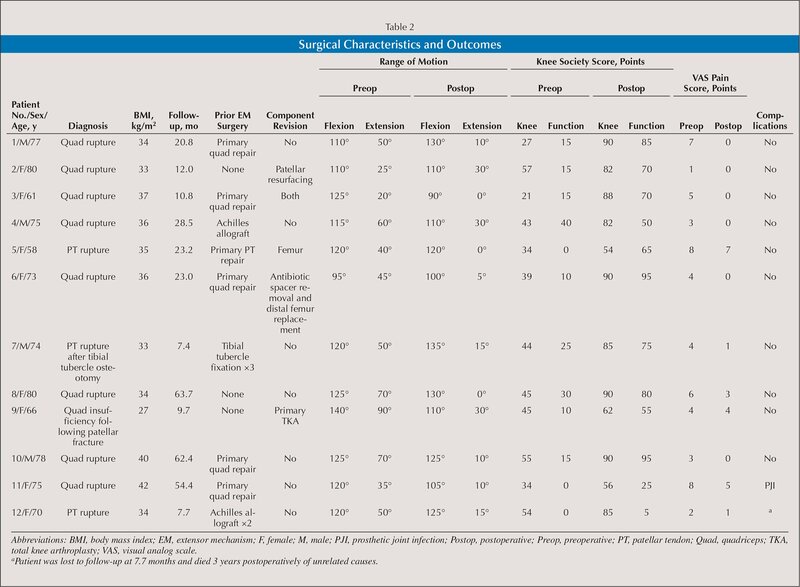 Two patients were in the early postoperative period (<6 months from surgery) and were excluded, leaving 12 patients for final analysis (Tables 1–2). One patient (patient 12) was lost to follow-up after 7.7 months and died 3 years after surgery of unrelated causes. The final cohort consisted of 9 patients with quadriceps ruptures and 3 patients with patellar tendon ruptures. All but 1 patient (patient 8, unicompartmental knee arthroplasty) had undergone previous TKA. Twelve previous failed EM reconstructions had been performed in 9 patients, including primary quadriceps (n=5) and patellar tendon (n=1) repair, Achilles tendon allograft reconstruction (n=3), and tibial tubercle fixation (n=3). Three patients had no previous EM surgery before EM reconstruction. Seven patients solely underwent EM reconstruction, while 4 had concomitant component revision, including patellar resurfacing (n=1), revision of both components (n=1), 1 component (femur) (n=1), and antibiotic spacer removal and distal femoral replacement reimplantation (n=1). Femoral and/or tibial implants were revised only if preoperative or intraoperative evaluation suggested malalignment or malrotation. Finally, 1 patient underwent primary TKA at the time of EM mesh reconstruction for chronic quadriceps insufficiency resulting from a displaced patellar fracture. Preoperative and final postoperative active knee range of motion after EM reconstruction at mean follow-up of 27.0 months (range, 7.4–63.7 months) is shown in Figure 2. There was no significant difference in mean preoperative (118.8°±10.9°; range, 95°–140°) vs postoperative (115.8°±13.8°; range, 90°–135°) active knee flexion (P=.54). Mean active knee extension improved significantly from baseline (47.9°±20.5°; range, 20°–90°) following EM reconstruction (12.9°±11.6°; range, 0°–30°; P<.0001). Three patients (27.3%) had no residual extensor lag, and 3 patients had persistent residual lag of 30°. There were no EM reconstruction incorporation failures. Preoperative and postoperative active knee range of motion. Asterisk indicates significant difference (P<.0001). Error bars indicate 1 standard deviation. 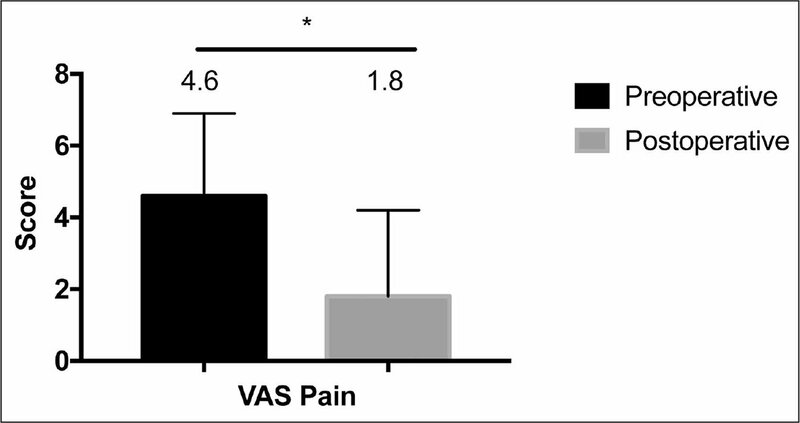 Mean visual analog scale pain scores decreased significantly after EM reconstruction (Figure 3): preoperative, 4.6±2.3 (range, 1–8) vs postoperative, 1.8±2.4 (range, 0–7; P=.01). Significant improvements in KS scores were observed after EM reconstruction (Figure 4): The mean KS knee score improved from 41.5±11.1 (range, 21–57) preoperatively to 79.5±13.8 (range, 54–90) postoperatively (P<.0001). The mean KS function score improved from 14.6±12.3 (range, 0–40) preoperatively to 64.2±27.1 (range, 5–95) postoperatively (P<.0001). Preoperative and postoperative visual analog scale (VAS) scores for pain. Asterisk indicates significant difference (P=.01). Error bars indicate 1 standard deviation. 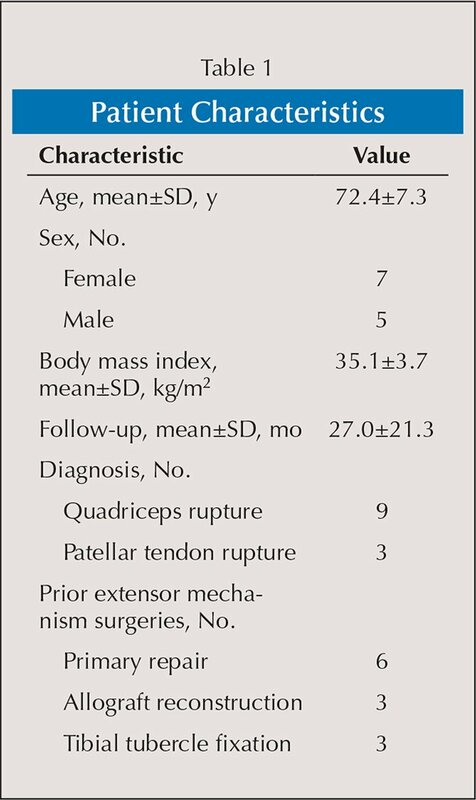 Preoperative and postoperative Knee Society scores. Asterisks indicate significant difference (P<.0001). Error bars indicate 1 standard deviation. At the most recent follow-up, all patients were ambulatory, with 9 requiring occasional use of 1 cane, 1 needing 2 canes full time, 1 with a hinged brace, and 1 without any assistive devices. Two patients (patient 11 and patient 12) were unable to ascend and descend stairs, leading to low postoperative KS function scores. One patient (patient 11) who moved out of state was contacted for a phone interview. Unfortunately, this patient was found to have developed a prosthetic joint infection and was treated by an outside institution with irrigation and debridement, component retention, and chronic antibiotic suppression. Although she was not available for formal examination, the patient was ambulatory with a cane and endorsed the ability to actively extend her knee to an extent similar to that recorded during the authors' last follow-up. This patient (9.1%) was considered to be a clinical failure. No other intraoperative or postoperative complications occurred. Extensor mechanism dysfunction after TKA is a devastating complication with historically poor outcomes. The level of disruption, iatrogenic factors (eg, intraoperative injury, component malalignment), chronicity of injury, local tissue quality, and degree of functional disability combined with patient demands and medical status all must be considered in determining the optimal treatment for EM failure. More recently, Nodzo and Rachala15 evaluated 7 quadriceps tendon ruptures treated with synthetic Marlex mesh (C. R. Bard, Murray Hill, New Jersey) reconstruction. At average follow-up of 34 months, 4 of the 7 were considered clinical successes, with extensor lag less than 30°. Three patients had re-ruptures, and 2 of these patients became infected. Of the 5 functioning knees, the extensor lag improved from 50°±13° to 20°±15° (range, 5°–40°) (P=.01). Knee Society scores improved significantly for function (20±30 to 45±54; P=.03) and pain (44±18 to 74±78; P=.02). Postoperatively, the patients in this series were immobilized in a hinged brace for 6 to 8 weeks. Ormaza et al14 reported on 3 patients with chronic quadriceps tendon ruptures who underwent mesh reconstruction. All 3 patients had successful outcomes at 19-month follow-up. Following reconstruction, KS function scores improved from 55.7 to 87.3 (P=.01). The postoperative visual analog scale pain score was 2.3 and extensor lag was 3.3°. No complications were reported. Browne and Hanssen13 reported 13 patients who underwent patellar tendon reconstruction using synthetic mesh, with a mean follow-up of 42 months. Five had previous failed allograft reconstructions. Three patients had mechanical failure and 1 developed recurrent infection, resulting in clinical success in 69% of patients. Extension lag improved from 36° to 10° (P=.001; 2.8° in those without complications). Final postoperative flexion was maintained (range, 103°–107°). Knee Society scores improved significantly for function (range, 36–75; P=.0004) and pain (range, 20–50; P=.007). Abdel et al19 recently published an expanded follow-up to the cohort of Browne and Hanseen,13 consisting of 77 TKAs with a variety of EM deficiencies (27 quadriceps tendon disruptions, 40 patellar tendon disruptions, and 10 patellar fractures). Knee Society scores were significantly improved at average follow-up of 4 years. Six patients (8%) developed prosthetic joint infection. Mean extensor lag improved significantly from 35°±17° to 9°±14° (P<.001), while flexion was unchanged from baseline. The overall 2-year survivorship free of mesh failure was 85%. Sixteen patients experienced mesh failure following a traumatic event, of whom 12 ultimately required revision surgery. The authors suggest that patients with continued quadriceps muscle weakness following immobilization, especially those with multiple medical comorbidities, may need prolonged knee protection to avoid a fall. The results in the current series are consistent with previous reports regarding synthetic mesh EM reconstruction. All 11 patients who were free of infection were a clinical success, with an extensor lag of 30° or less (mean, 12.9°) and low residual pain scores. Final KS function scores were variable; however, all patients were ambulatory. The small sample precluded further analysis regarding predictive factors for poorer outcomes. Importantly, the authors found no significant loss of final postoperative flexion despite their strict postoperative immobilization regimen. An abbreviated rehabilitation protocol with early range of motion at 3 weeks following Achilles tendon allograft EM reconstruction determined that brief immobilization did not allow graft incorporation, leading to early rupture.7 A histologic analysis of a canine model with Marlex-50 polyethylene mesh (Phillips Petroleum Company, Bartlesville, Oklahoma) as a ligament scaffold showed fibrous infiltration of the graft with subsidence of the inflammatory response at 12 weeks.21 Strict postoperative compliance with immobilization in full extension is paramount. The limitations of this study were those inherent to a retrospective review of a small series of patients. This is an uncommon injury, and multicenter trials may be necessary to capture larger cohorts. Although no histologic analysis or postoperative advanced imaging was obtained to specifically evaluate graft incorporation, no patient required revision EM surgery or experienced EM re-rupture. Although this study included only a few patients, it is a significant addition to the existing literature, which previously consisted of only 86 total patients who had undergone synthetic mesh EM reconstruction after knee arthroplasty.13–15,19 The authors' findings help validate the reproducibility of synthetic mesh EM reconstruction after knee arthroplasty. Extensor mechanism reconstruction using synthetic mesh effectively restores knee function for a variety of EM deficiencies, providing patients with a stable limb for ambulation. Low pain, low residual extensor lag, and acceptable knee function can be expected at mid-term follow-up. Complication rates and failure rates appear to be lower with mesh vs allograft reconstruction. Further research is needed to determine the longevity of mesh constructs. Rand JA, Morrey BF, Bryan RS. Patellar tendon rupture after total knee arthroplasty. Clin Orthop Relat Res. 1989;244:233–238. Dobbs RE, Hanssen AD, Lewallen DG, Pagnano MW. Quadriceps tendon rupture after total knee arthroplasty: prevalence, complications, and outcomes. J Bone Joint Surg Am. 2005;87(1):37–45. Emerson RH Jr, Head WC, Malinin TI. Extensor mechanism reconstruction with an allograft after total knee arthroplasty. Clin Orthop Relat Res. 1994;303:79–85. Insall JN, Dorr LD, Scott RD, Scott WN. Rationale of the Knee Society clinical rating system. Clin Orthop Relat Res. 1989;248:13–14. Winston LA, Terry AF, Jardine JH, Parrish FF. The result of replacement of partial or total collateral ligaments with Marlex mesh in the knees of dogs. Clin Orthop Relat Res. 1978;137:287–290. Prior extensor mechanism surgeries, No. The authors are from the Department of Orthopaedic Surgery (DKB, JSP), Rutgers Robert Wood Johnson Medical School, New Brunswick, and University Orthopaedic Associates (SK) and the Orthopaedic Center of New Jersey (AJT), Somerset, New Jersey. Drs Bateman and Preston have no relevant financial relationships to disclose. Dr Kayiaros is a paid consultant for DePuy Synthes Orthopaedics. Dr Tria is a paid consultant for Smith & Nephew. Correspondence should be addressed to: Dexter K. Bateman, MD, Department of Orthopaedic Surgery, Rutgers Robert Wood Johnson Medical School, 1 RWJ Place, MEB 422A, New Brunswick, NJ 08901 ( dexterbateman@gmail.com).